The new Citroën C3 Aircross Compact SUV will be launched in Ireland this November offering class-leading space, modular design, connectivity and innovative technology solutions. The new generation SUV has been influenced by the Citroën Advanced Comfort® programme and is designed for ease of use. 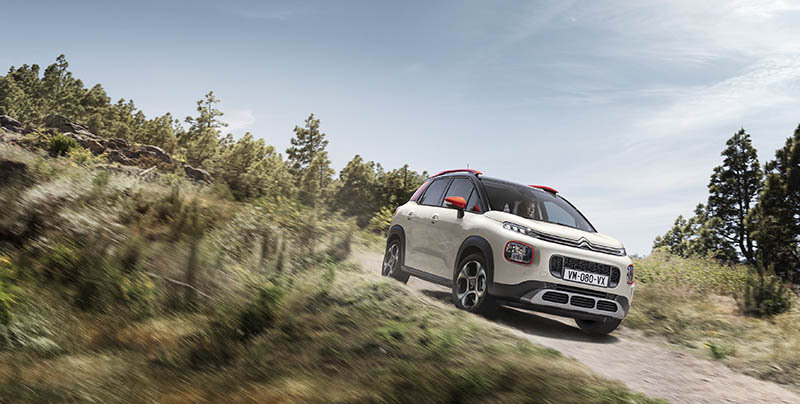 The new C3 Aircross marks the beginning of Citroën’s SUV offensive in Europe and enters the increasingly popular B-SUV segment, currently 16 per cent of the Irish passenger car market. Epitomising the best of Citroën in terms of comfort and design, the C3 Aircross stands out as a unique offering in this expanding segment. Set to shake-up the market with its highly customisable character and distinctive SUV design, the new C3 Aircross introduces a number of new technologies to the Citroën range including Wireless Smartphone Charging and Grip Control® with Hill Descent Assist. Technology continues as a core theme in the new C3 Aircross with 12 different technologies that assist your journey including voice controlled 3D navigation, keyless entry and start, a reversing camera, lane departure warning and blind-spot monitoring. The new C3 Aircross also offers best-in-class space for maximum passenger comfort, with generous legroom in the front and rear, as well as an exceptional modular boot space with a volume of up to 520-litres. Orders are set to open in early October, with the announcement of pricing and the full Irish range of engine options with the efficient PureTech petrol and Blue HDi diesel engines set to be included in the range. For further information, contact your local Citroën dealer or to register your interest in the exciting New C3 Aircross, please visit www.citroen.ie.